Gary Dean Smith: COMBO Songwriting Contest winner! 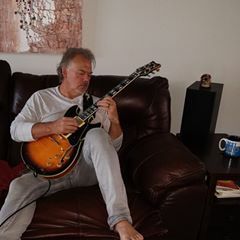 Spencer Pyne writes: For the last 12 months I have been working with some amazingly talented musicians and we are going to bring our blend of original jazz and blues to the listening public on Thursday, November 15th at the Walnut Room, 3131 Walnut Street in (north) downtown Denver. This past Summer we recorded several original tunes at John Macy’s Mighty Fine Productions under the guiding hand (and ears) of Grammy winning producer/bassist, Jimmy Haslip. Our CD, “Awakening”, is now scheduled for release in early January 2019 on Manta Ray Records, a subsidiary of Sony Music. This band for me is the culmination of many years of playing and performing with dozens of different bands in virtually every genre. I have always loved jazz and it seems that I have finally found like minded players that share the passion and dedication necessary to bring this music to life! The show starts at 8:00 p.m. and Colorado’s own Symbols will open things up with a high powered set. We will take the stage at 9:00 PM and perform the tunes from the CD as well as several others. Please join us for an evening of original contemporary jazz and blues. Tickets are available for $10.00 or I can sell you one personally. Thanks for continuing to support live original music. I hope to see you there! I have had one in my hands for pretty much as long as I can remember. I can be having a really rotten day but if I somehow manage to pick one up and slap, spank or pluck it, I always feel much, much better. So this is where you will find out all about my love for the Bass and for music in general. I will tell you about my varied musical projects both past and present as well as the many talented people who have helped me to achieve my personal musical goals. Music is a mystical and powerful thing that affects all of us in ways we probably don’t even realize.